The walls are up, the siding is on, and our cute little 18’sq cabana is nearly finished! We had to leave Nicaragua at this point and are very excited to get back down there and put in the details like counter tops, stairs, etc. This entry was posted in Green Building and Bamboo, Nicaragua and tagged building in nicaragua, cabana, hipehabitat, holly beck, horizontal pine siding, kim obermeyer, thatch roof. Bookmark the permalink. wow love this cabana,I can see myself in one of these.the thatched roof looks awsom.We did some simulated ones in oahu at koleana for disneys hotels that look almost real but Ive never done real ones like yours .good job! 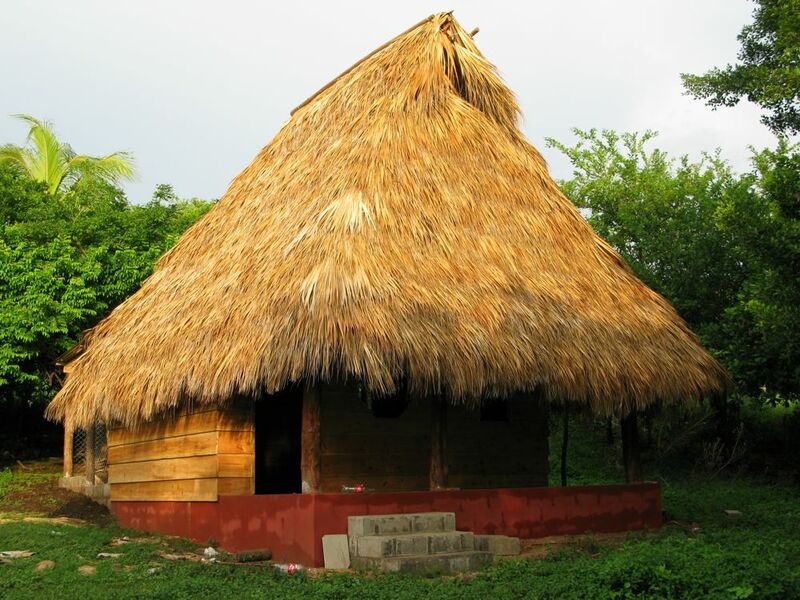 hey guys, Im thinking of starting a hostel in central america. I was wondering if you could help me about the budget planning for the construction. Can you email me, maybe we could even make good business together! This is great, you guys! My boyfriend and I recently bought a little piece of land in Nicaragua. The relatively simple and green construction of our house will take place over the next few to several visits, and hopefully in between, by way of our local friends. We are hoping to get a cabana up next time we are there, hopefully in the early spring, again with the help of some of the local folks. We are hoping to find some heavy mosquito netting in rolls that we could operate like blinds, and then only do posts and platforms, with no walls. We are closer to empty nests and retirement, and think this investment made much more sense than trying to live on pension, here in Alberta where it’s frozen for 8 months a year. Life is more beautiful with the tropical sun on our skin and the ocean in our ears and splooshing over our feet.